Ensure high-yield, nondenaturing antibody purification using IgG affinity purification supports with these gentle buffer solutions. These products include IgG Binding Buffers specific for each immunoglobulin-binding protein (Protein A, Protein G, Protein A/G). The Pierce IgG Elution Buffer provides efficient dissociation and elution of antibodies from all three IgG-binding proteins, including Protein L. This low-pH elution buffer is also effective for most antibody-antigen or protein-protein affinity purification systems. 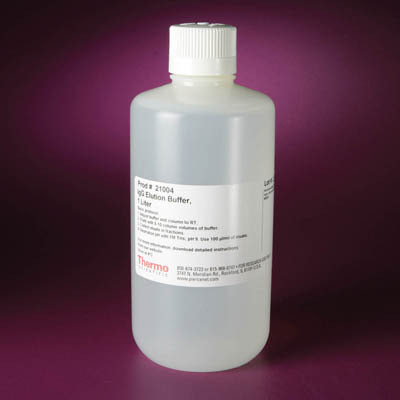 The Gentle Ag/Ab Binding and Elution Buffer system uses near-neutral, high-salt conditions for elution, enabling even sensitive and labile antibodies (or other proteins) to be eluted from an affinity system without denaturation and inactivation. The phosphate-free binding buffer in this system is a necessary substitute for the Protein A binding buffer (pH 8), which precipitates with the Gentle Ag/Ab Elution Buffer. Finally, the Mouse IgG1 Mild Elution Buffer, when used in combination with Protein A resin, enables selective elution and separation of the IgG1 subclass from total bound mouse IgG.